-Wooden squares. I used two packages for the one I made. 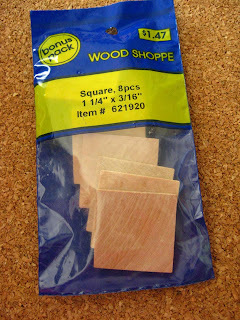 Originally I had wanted the squares to be larger than 1 1/4" square and was going to order some from here. At the last minute I decided to just make them smaller. I found these at Hobby Lobby. Most craft stores will have them. However, if it's for a fairly young child, the bigger ones might be better for their hands to grasp. -You'll also need some white paint. I painted them with acrylic paint, you can also spray paint them. -Krylon Shiny clear coat finish. So, just paint the front and back of the tiles. We're trying to make the back side as uniform as possible. Even a slight difference can detract from matching the pieces. 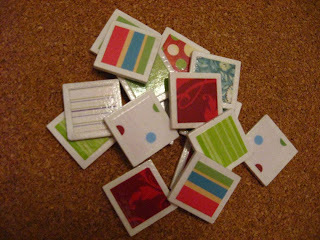 Use the mod podge to adhere the paper to the tile, adhering one piece to each tile. When this is dry, give it a few coats of Krylon clear coat to finish it off. Don't forget to use the clear coat on BOTH sides, not just the side that has the paper on it. If you're really crafty, you can make a little drawstring bag to store them in. (I wanted to, but didn't have time.) This is such a small game that I could see this being carried around for waiting rooms in the doctors office or other such occasions. 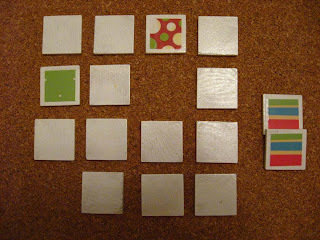 Here is my pile of finished matching tiles. Close-up. I love how the clear coat really gave it a smooth finished look! The entire project took me about an hour, not including the clear coat drying time. 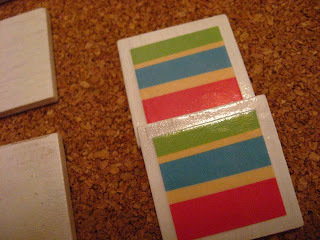 And the only thing I didn't have on hand was the wooden tiles, which I spent $3! This is darling! I'm going to try it with photographs of the kids and our family. So fun! Thanks for this tutorial! I recently made some memory cards of ancestors with their names below their picture so that my son could learn who they are. They turned out great, but they would be even better modpodged onto wood. I LOVE this idea. I followed your tutorial, I have a picture of the completed project on my blog along with a link back to your page. :) I tried to post a pic here but it wont let me post html in your comments. Thank you so much for this fun idea!